Cool and creamy, coffee for a hot day. I love coffee, any way I can get it! For a delightful difference, iced coffee is a cool refreshing treat! What’s great about this coffee recipe is that you can make it as strong or sweet as you like. 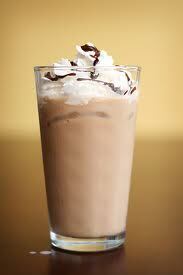 Combine coffee, sugar and hot water in a blender or with a mixer; blend in ice cream and milk. Pour into glasses. Top with scoops of vanilla ice cream or whipped topping, if desired. Garnish with a chocolate drizzle. Makes 3 1/4 cups.